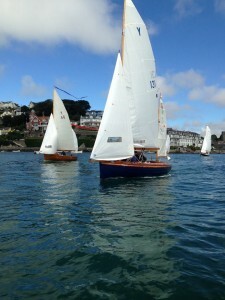 South Devon is perfect for messing about on the water. We are fortunate enough to enjoy surfing, kayaking and paddleboarding on our local beaches. A few years ago we purchased a Salcombe Yawl which we enjoy sailing in the Salcombe Estuary or taking out for a leisurely picnic. The Salcombe Yawl has a history which goes back at least 200 years traditional yawl rigged local fishing vessels of the late 18th-early 19th century. 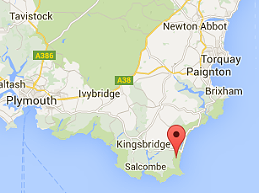 By 1823 the yawl-rigged fishing-boat, had become established as a common sailing boat on the South Devon coast. The Salcombe Yawl is traditionally hand built locally in South Devon from mahogany. The centre plate is cast iron or bronze. 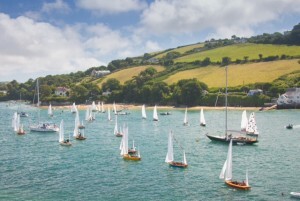 There are approximately 180 Salcombe Yawls, each with their own unique number who regularly race in the estuary. For the 50th Anniversary of the Salcombe Yawl Association we took part in a sail past of the Salcombe Yacht Club, lining up on the water in numerical order, which was no mean feat but quite a spectacle to watch!